Our success is a team effort, supported by a creative, innovative work environment that attracts and rewards exceptional talent. We focus on peerless service to tenants and residents, working with best-in-class partners, and building trusted relationships based on a foundation of respect and integrity. Sharing insights with peers, learning from our mistakes and acting with compassion are important aspects of how we operate and advance industry excellence. Ensuring a meaningful social and environmental legacy is one of our defining objectives. We do this through our passion for building and supporting communities and being a leader in sustainability. We understand that our properties are more than just bricks and mortar – they are places where people live, work, shop, dine and play. We are proud to create environments that enhance the lives of the people and communities we serve. Our vision and purpose inspire us to excellence. Along with our values, they guide us like a north star to define the role we each play in making the future bright for all. 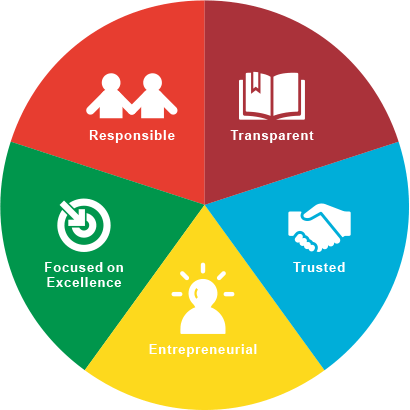 As a company, we promote service excellence, responsibility, transparency and respect. As a team, we are forward-thinking, ambitious and entrepreneurial. We are also proud of our roots. Our values reflect this. To be a leading global real estate partner, recognized for making meaningful contributions to our communities while delivering strong investment returns and prudent growth. Now and for generations to come. To create living and working environments that enhance the lives of the people and communities we serve.